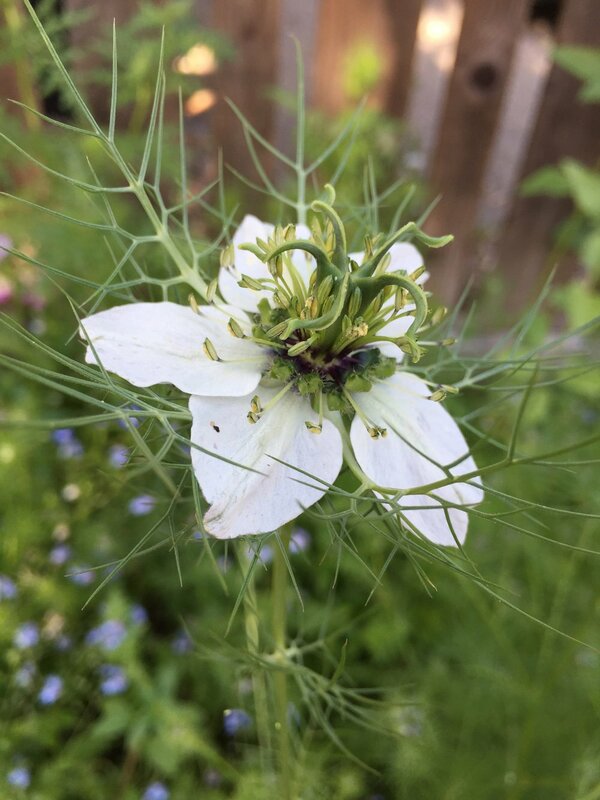 This month's wreath is made out of a flower familiar to all of us, Nigella damascena or Love-In-A-Mist. You plant this flower once, and you'll have it for as long as you want it. It can be a little pushy in your flower beds, but I really like it coming up every year and allow it to re-seed freely. It has that lovely, tall, blow-in-the-wind quality that I like so much; it's ferny foliage can be a nice backdrop for larger, showier flowers. Plus, the bees like it. The botany of this flower is interesting. First of all, all parts of this plant are toxic and should not be consumed. Secondly, the flower 'petals' that you see are not petals at all, but colored sepals. The actual flower petals are clawed at the base of the stamens (they look sort of green). The stamens (male parts) are numerous. The pistils (female parts) are in the center and have that spider look. As you can see in the flower below, there are five pistils, which means five carpels, or chambers, in the ovary. Which forms a bloated capsule that opens when dry to release all the seeds. The capsules are attractive too. The ferny leaves are pinnately divided and thread-like.